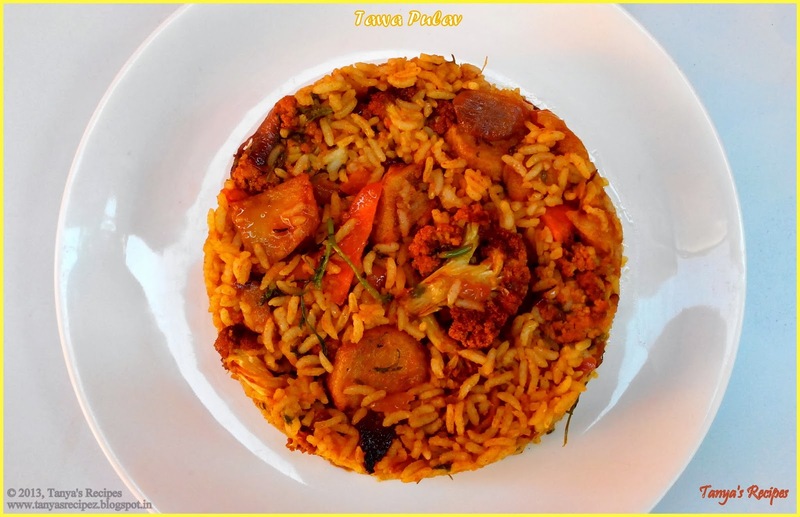 Tava/Tawa Pulav is a popular street food in India very commonly found in streets of Mumbai!It is made from rice and mixed vegetables all stir-fried together Pav bhaji tawa. I have tried some changes in the regular recipe and it worked very well for me. It was absolutely very easy to make and very delicious to eat. This dish can also be made in a large wok/kadai if you do not have a wide tava. Heat enough oil for deep frying in a kadai. Deep fry all the veggies separately till they turn golden brown and keep it aside. Heat remaining oil in a non-stick pan. Add shah jeera and onion and saute till onion turns pink. Add ginger garlic paste and saute. Add turmeric powder, red chili powder, coriander powder, pav bhaji masala and salt. Add coriander leaves and give it a mix. Add the fried veggies and lemon juice and mix it well. Add the cooked rice and mix. Serve hot with raitha. ü You can add any vegetable of your choice like French beans, peas etc.